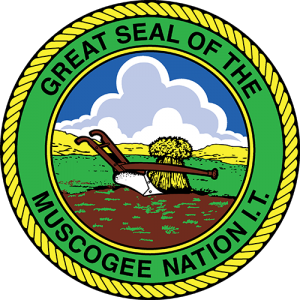 Muscogee (Creek) Nation is the largest of the federally recognized Muscogee tribes. The Muscogee (Creek) Nation is regarded as one of the historical Five Civilized tribes. Today the Muscogee (Creek) Nation is headquartered in Okmulgee, Oklahoma. They have tribal jurisdiction in Creek, Hughes, Okfuskee, Okmulgee, McIntosh, Muskogee, Tulsa, and Wagoner counties in Oklahoma. The Muscogee (Creek) people are descendants of a remarkable culture that once spanned all of what is now the Southeastern United States. The Muscogee were not one tribe but a union of several. This union evolved into a confederacy that was the most sophisticated political organization north of Mexico at the time. Member tribes were called tribal towns. Within this political structure, each tribal town maintained political autonomy and distinct land holdings. The confederacy was dynamic in its capacity to expand. Within this confederacy, the language and the culture of the founding tribal towns became dominant. Throughout the period of contact with Europeans, most of the Muscogee population was concentrated into two geographical areas. The Muscogee peoples occupying the towns on the Coosa and the Tallapoosa rivers were called Upper Creeks, and those to the southeast, on the Chattahoochee and Flint rivers, the Lower Creeks. The distinction was purely geographical. Due to their proximity to the English, the Lower towns were substantially affected by intermarriage and its consequent impact on their political and social order. The Upper towns remained less effected by these European influences. In the early 19th century, the United States Indian policy focused on the removal of the Muscogee and the other Southeastern tribes to areas beyond the Mississippi River. In 1832, Muscogee leadership exchanged the last of the cherished Muscogee ancestral homelands for new lands in Indian Territory (Oklahoma). For the majority of Muscogee people the process of severing ties to a land they felt so much a part of proved impossible. But, in 1836 and 1837, the U.S. army enforced the removal of more than 20,000 Muscogee (Creeks) to Indian Territory. The American Civil War was disastrous for the Muscogee people. The first three battles of the war in Indian Territory occurred when Confederate forces attacked a group of neutral Muscogee (Creeks). Neutrality would prove an impossibility for the majority of the Muscogee people. Eventually Muscogee citizens would fight on both the Union and Confederate sides. The reconstruction treaty of 1866 required the cession of 3.2 million acres, about half of the Muscogee domain. In the late 1800s the Dawes Commission began negotiating with the Muscogee Nation for the allotment of the national domain. In 1898, the United States Congress passed the Curtis Act, which made the dismantling of the National governments of the Five Civilized Tribes and the allotment of tribal domains inevitable. However, in 1890, the noted statesman Chitto Harjo helped lead organized oppositions to the dismantling of the Muscogee National government and the allotment of lands. He firmly believed that all Muscogee people possessed an inherent right to govern themselves. For individuals like him it was unimaginable that the Nation could be dissolved by the action of a foreign government and he was right. The end of the Muscogee Nation did not occur. In the early 20th century, the process of allotment of the National domain to individual citizens was completed. However, the perceived dismantling of the Muscogee government was never fully executed. The Nation maintained a Principal Chief throughout this stormy period. In 1971, the Muscogee people, for the first time since the partial dismantling of their National government, freely elected a Principal Chief without Presidential approval. During the 1970s the leadership of the Muscogee (Creek) Nation drafted and adopted a new constitution, revitalized the National Council and began the challenging process of Supreme Court decisions to affirm the Nation’s sovereign right to maintain a national court system and levy taxes. The federal courts have also consistently reaffirmed the Muscogee Nation’s freedom from state jurisdiction. The present day Mound building located in their Tribal headquarters houses the National Council Offices and Judicial Offices. Today the Muscogee (Creek) people are actively engaged in the process of accepting and asserting the rights and responsibilities of a sovereign nation. The Muscogee (Creek) are aware of the necessity for knowing and understanding their extraordinary historical and cultural inheritance. In 1971, the Muscogee people, for the first time since the partial dismantling of their National government, freely elected a Principal Chief without Presidential approval. During the 1970s the leadership of the Muscogee (Creek) Nation drafted and adopted a new constitution, revitalized the National Council and began the challenging process of Supreme Court decisions to affirm the Nation’s sovereign right to maintain a national court system and levy taxes. The federal courts have also consistently reaffirmed the Muscogee Nation’s freedom from state jurisdiction. The present day Mound building located in their Tribal headquarters houses the National Council Offices and Judicial Offices. The Muscogee (Creek) Nation is headquartered in Okmulgee, Oklahoma. They have tribal jurisdiction in Creek, Hughes, Okfuskee, Okmulgee, McIntosh, Muskogee, Tulsa, and Wagoner counties in Oklahoma. The Mvskoke Language Program will preserve, maintain and revitalize the language of the Muscogee (Creek) Nation, by connecting with tribal elders, encouraging adult citizens and teaching our children the significance of reading, writing and speaking the language of our ancestors. Mvskoke Language Program is a Resource Center for speaking and teaching the Mvskoke Language. The Muscogee (Creek) people are actively engaged in the process of accepting and asserting the rights and responsibilities of a sovereign nation. The Muscogee (Creek) are aware of the necessity for knowing and understanding their extraordinary historical and cultural inheritance. Today the Nation serves over 58,000 enrolled allottees and their descendants. The tribe operates a budget in excess of $290 million, has over 4,000 employees, and provides services to within their jurisdiction. ]The tribe has both gaming (casino related) and non-gaming businesses. Non-gaming business vetures include both Muscogee Nation Business Enterprises (MNBE) and Onefire. MNBE and Onefire oversee economic development as well as investigating, planning, organizing and operating business ventures projects for the tribe related to non-gaming business. Their Gaming enterprises consists of 9 stand alone casinos; the largest being River Spirit Casino Resort featuring Margaritaville in Tulsa. The revenue from both gaming and non-gaming business are reinvested to develop new businesses, as well as support the welfare of the tribe.